- What do I need to bring with me to CAMP VC ? Easy! Camping gear (Tent, sleeping bag, head torch, portable phone charger), Cash for anything you wanna buy onsite from food/ coffee to merch. If you already have your own helmet please bring it to site but we do have an extra one in every size from the lovely DMD for our beginners riding class. We also have boards & pads for beginners on the skate ramp but please feel free to bring your own gear if you have it! If you would like to take part in the free yoga classes onsite we have a limited number of mats for participants but if you have your own please bring it along. If you want to sign up & pay extra for the enduro training with Black desert training, trials riding class with Inch Perfect trials or beginners riding class with Days on the Dirt (info & sign up launching soon) you get all equipment, gear (helmet, boots, jersey), bikes, insurance & tuition with the price so only yourself to bring along to those ones. - I dont already ride/ skate etc, so can I come to Camp VC? Of course! We've got loads of onsite activities for anyone who doesn't ride already. We've not only got onsite beginners lessons onsite for anyone who wants to give riding their first try but we've also loads more - from free yoga, free vertical climbing wall, free skate ramp with lessons, live team talks from inspirational women adventurers & sports women, film screenings, workshops from screen printing & sign painting to adventure film making & photography, dirt bike classes, a bar & live entertainment every night so plenty to keep you going all weekend long! PHEW! - I want to sign up to one of the onsite classes at CAMP VC. When can I register? All of our onsite classes that require sign up (Beginners riding class, Enduro riding class with Tamsin jones & Skate School ) will open for sign up on Saturday July 20th @ 10am . As a ticket holder to the event you will receive an email ahead of this as reminder. Please remember that we have limited spaces for alot of our classes do if there is a class that you desperately want to be a part of make sure you sign up fast on the 20th as our classes fill up very fast! 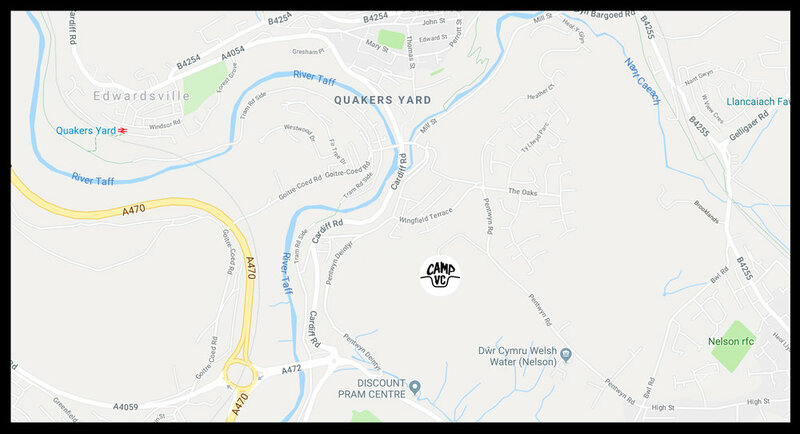 Don't worry if you miss out though as we have plenty onsite at CAMP VC that doesn't require you to sign up so you can just rock up & join in on the day! - I'll be coming to CAMP VC solo, Is that cool? HELL YES! Thats exactly what the event is for. We have plenty of ladies come alone every year & have the best time. Come alone leave with a ton of new pals. Mannnnnnnn..... We have a bunch of 125cc bikes that ride from London to Wales for our event every year...no excuses ladies. Get out & get on that road trip! - Coming from outside the UK & need a rental? Don't Worry! We'll be hooking you with special deals from UK rental companies so stay tuned for more info on our insta & website coming very soon! - I have a special diet. Will I be able to buy food at CAMP VC? We're working hard with our onsite food truck from the amazing BEAUTIFUL AND THE FEAST to make sure everyone will be able to purchase food onsite but if in doubt shoot us an email via our contact page & we'll do our best to help! - Can I bring a car to CAMP VC? Yes! Not everyone will be riding so its cool to bring your car but you will need to purchase a ticket + with the added car pass on for an additional £5 so we know you're coming & we'll be able to allocate you extra parking space. You'll only need one person with a car ticket per car so fill em up with your pals! - Can I come if I'm under 18? Unfortunately not this time. 18+ only ladies. Please also bring your ID's so we can check you off with your ticket when you arrive onsite. - Is my ticket refundable? Unfortunately tickets are non refundable & but can be transferred into another name by getting in touch via our contact page. - Can I buy a ticket on the day/ at the event site? CAMP VC is a safe, non judgmental, jealousy free space for all female identifying people. We are an LGBTQ+ friendly event and have zero tolerance towards racism, transphobia, homophobia and sexism of any kind. Bring the good vibes and a smile and get ready for the best weekend of your summer!